In January I forecast the unemployment rate would hit 9.8% by August. Meanwhile, even though it was clear the Fed was wildly off base in its adverse scenario, the Fed upped it total to a mere 9.2% to 9.6% for the year as noted in Fed's Economic Forecast Worsens; Still Ridiculously Optimistic. Given that unemployment is likely to continue rising through the end of the year, and probably for another six months to a year after that, it can be seen the Fed is still ridiculously optimistic, unless they revised higher again and I missed it. This morning, the Bureau of Labor Statistics (BLS) released the August Employment Report. 216,000 jobs were lost in total vs. 247,000 jobs last month. 65,000 construction jobs were lost vs. 76,000 last month. 63,000 manufacturing jobs were lost vs. 52,000 last month. 80,000 service providing jobs were lost vs. 119,000 last month. 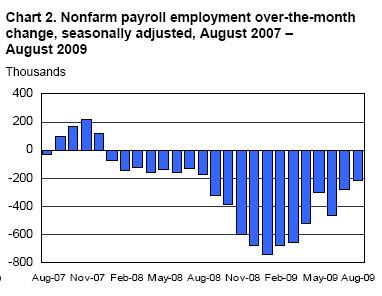 10,000 retail trade jobs were lost vs. 44,000 last month. 22,000 professional and business services jobs were lost vs. 38,000 last month. 52,000 education and health services jobs were added vs. 17,000 added last month. 21,000 leisure and hospitality jobs were lost vs. 9,000 added last month. 18,000 government jobs were lost vs. 7,000 last month. A total of 136,000 goods producing jobs were lost (higher paying jobs). 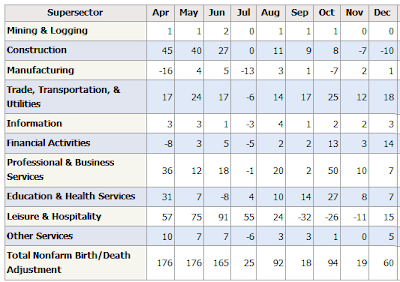 It was nearly a clean sweep again this month with education and health services jobs the only real winner for the month. 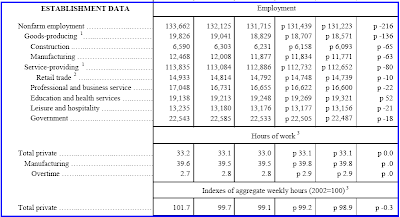 Work hours were flat at 33.1. Short work weeks contribute to household problems. At this point in the cycle birth death numbers should have been massively contracting for months. 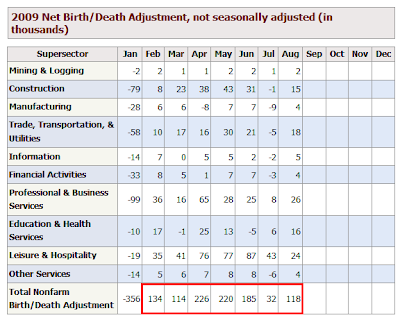 The BLS is going to keep adding jobs through the entire recession in a complete display of incompetence. The Birth/Death numbers have been a joke for at least two years now. In August, the number of unemployed persons increased by 466,000 to 14.9 million, and the unemployment rate rose by 0.3 percentage point to 9.7 percent. The rate had been little changed in June and July, after increasing 0.4 or 0.5 percentage point in each month from December 2008 through May. Since the recession began in December 2007, the number of unemployed persons has risen by 7.4 million, and the unemployment rate has grown by 4.8 percentage points. The civilian labor force participation rate remained at 65.5 percent in August. The employment population ratio, at 59.2 percent, edged down over the month and has declined by 3.5 percentage points since the recession began in December 2007. In August, the number of persons working part time for economic reasons was little changed at 9.1 million. These individuals indicated that they were working part time because their hours had been cut back or because they were unable to find a full-time job. The number of such workers rose sharply in the fall and winter but has been little changed since March. About 2.3 million persons were marginally attached to the labor force in August, reflecting an increase of 630,000 from a year earlier. (The data are not seasonally adjusted.) These individuals were not in the labor force, wanted and were available for work, and had looked for a job sometime in the prior 12 months. They were not counted as unemployed because they had not searched for work in the 4 weeks preceding the survey. Among the marginally attached, the number of discouraged workers in August (758,000) has nearly doubled over the past 12 months. (The data are not seasonally adjusted.) Discouraged workers are persons not currently looking for work because they believe no jobs are available for them. The other 1.5 million persons marginally attached to the labor force in August had not searched for work in the 4 weeks preceding the survey for reasons such as school attendance or family responsibilities. The chart shows there are 9.1 million people are working part time but want a full time job. A year ago the number was 5.9 million. This series has stabilized for the last 6 months. The official unemployment rate is 9.7% and rising. However, if you start counting all the people that want a job but gave up, all the people with part-time jobs that want a full-time job, all the people who dropped off the unemployment rolls because their unemployment benefits ran out, etc., you get a closer picture of what the unemployment rate is. That number is in the last row labeled U-6. It reflects how unemployment feels to the average Joe on the street. U-6 is 16.8%. Both U-6 and U-3 (the so called "official" unemployment number) are poised to rise further although most likely at a slower pace than earlier this year. Looking ahead, there is no driver for jobs and states in forced cutback mode are making matters far worse. 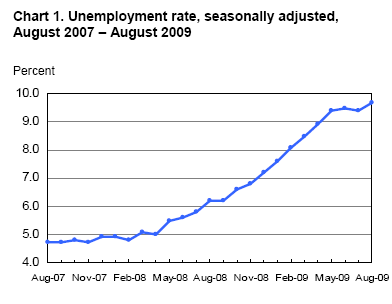 Unemployment is likely to continue rising until sometime in 2010. I consider these job losses to be depression level totals. Admittedly conditions are not as bad as the great depression, but this is certainly no ordinary recession by any economic measure including lending, housing, bank failures, jobs, the stock market, commodity prices, treasury yields etc. For more on this idea please see Humpty Dumpty On Inflation.